Many cordless products have been labeled professional-grade, but cordless power has never measured up to the performance of traditional, commercial gas equipment — until now. 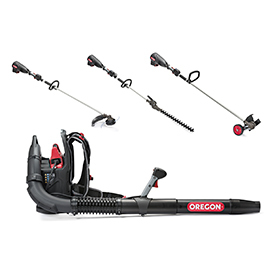 The new Oregon 120V Professional Series is engineered with more power and torque — driving more productivity than ever before. Tested tough to endure the rigors of professional use, the 120V Professional Series has an IP56 rating so you can work rain or shine. And because the equipment is also low noise, you can extend your work hours to have your work seen and not heard. Get more information or sign-up for a demo at Oregon120V.com.